Warning in advance: this post is short on pictures and it is short in general. The meatloaf is super easy to make and no one likes seeing a bunch of pictures of raw meat. You’re welcome. Let’s get to it! Mix the ground turkey in a bowl with diced onions, ketchup, egg, oatmeal, paprika, salt, and pepper. Line a baking dish with foil or spray with non-stick cooking spray. Form ground turkey into loaf in baking dish. Top with ketchup. Bake meatloaf in preheated 350 degree oven for 40-55 minutes. The thing about ground turkey is it dries out faster than ground beef. In addition, the meatloaf will probably be cooked before the outside browns. If it is a really nice shade of golden brown, it’s probably overcooked. When the meatloaf is cooked, it will no longer be pink. Well, that’s it… Writing this post about cooking the meatloaf took longer than it did to cook. Try the recipe and let me know what you think! Also, don’t forget to follow us on Pinterest, Instagram, Facebook, and Bloglovin! Line baking dish with foil or spray with nonstick cooking spray. 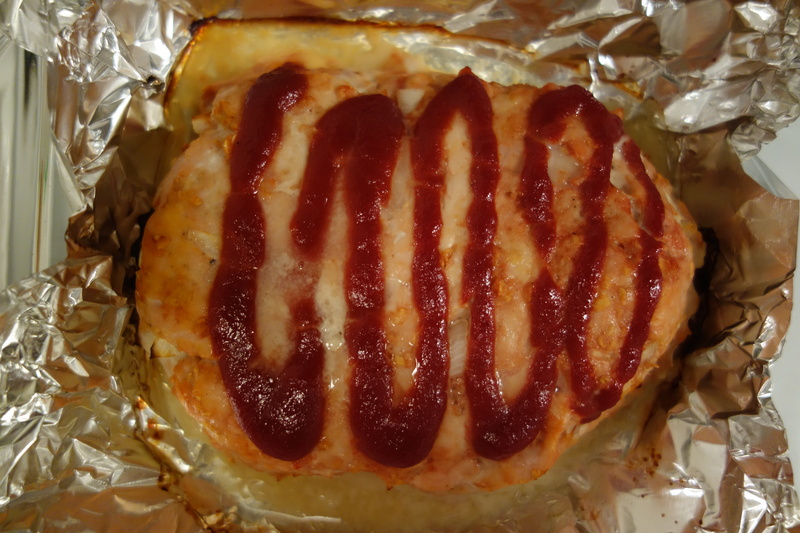 Form meatloaf mixture into loaf in baking dish and top with ketchup. Bake in preheated oven for 40-55 minutes. Meatloaf is cooked when it is no longer pink.